Yes. That’s right. I have bought a LOT of books since Christmas, and I’m a little bit in love with each and every one of them. A fair number of these you’ll have already seen from various TBRs and reviews, as I’ve already read a good number of them! So I’ve gone a little classics mad as of late. Since the start of December I have acquired quite a number. I received a good number of book tokens for my birthday at the end of November and a fair amount at Christmas, combined with relatives who are now no longer trying to not buy me books I’ve been very happy. I also was lucky enough to win a book token of £50 for my local store, Jarrold where I added to the classics! So, I bought a lot of Clothbound Classics this past few months. I have more than doubled my already quite large collection. First off I purchased the Dickens collection from Amazon – it was in their flash sales at £40 and with student discount I really couldn’t say no. I already had a copy of A Christmas Carol which was a gift a few years ago and I have gifted that to a family member. The set contained Bleak House, Oliver Twist, Hard Times, A Tale of Two Cities, Great Expectations and, as I said, A Christmas Carol. Then, between birthday gifts, Christmas gifts, and gifts to myself I added a few more to the collection. Tess of the D’ubervilles was a present from my grandmother, my parents (mum) bought Far From the Madding Crowd because she liked the bees on the cover! I preordered The Tenant of Wildfell Hall back in November when it was first announced as a clothbound edition as I loved the book and really wanted to add it to my collection. The Woman in White was a bargain – I found it in an Oxfam shop for £5. It was a little battered but I couldn’t say no at that price! War and Peace was an impulse buy. I went in Waterstones to buy a paperback edition of Frankenstein and came out with that. I loved Anna Karenina so I decided it was definitely a good purchase even though I have a paperbakc somewhere… I want to read this this Summer for certain! Finally there is Dracula. I love Dracula and have been lusting after this edition for quite some time. When I won the gift voucher I decided that buying it was acceptable. Penguin owns my heart. I also went a little mad with PEL editions. What you’ll notice here is I have some duplicates. There are some books I own as Clothbound here. I’m not going to lie, I like to have collections in both and I do find a paperback easier to read. Essentially, I collect the clothbound editions as pretty objects and the paperbacks as functional objects. So, since December I have accumulated these. Jane Eyre, Hard Times, The Sign of Four, Daniel Deronda, North and South, The Mayor of Casterbridge, Frankenstein, The House of Mirth and finally, A Room with a View. Daniel Deronda was the one I paid a bit for. I have discovered a love of George Eliot and Daniel Deronda is pretty much impossible to find new. This edition was about £10 from Ebay and I really don’t regret it. I also purchased another book with it from the same seller for about £2.50 so it averaged out at the £6 a book I would ordinarily pay for them. Finally the very little popular fiction I acquired. It’s a very small pile indeedy. I purchased The Chimes and The Buried Giant with the voucher I won. I really want to reread The Buried Giant as I didn’t much care for it initially but it’s a book which has stuck with me quite a bit so I’m interested to see if my opinion of it changes on a reread. I also picked up some charity shop bargains in the shape of Kitchen, Collected Stories of Gabriel Garcia Márquez and Poor Things. What can be drawn from this haul is I’m going to be reading a lot of classics in the near future and I’m very excited about that! This is a fairly chunky haul, not only that I feel I’ve forgotten a huge number of books I did buy since July (when I did my previous haul). I also realise, looking back on it, that I’ve included one book in here that I included in that. Oops. I’ve been at it again! I really ought to stop, and I will. Soon. But July is at a close and while I promised, promised myself I would ease up on the book buying I seem to have failed spectacularly. Some of these books have actually been sat on my shelf for quite some time and I have simply forgotten to haul them. But without further ado, let me show you the damage that has been done in July! So at the start of the month I actually went to an event at my local Waterstones store. Peer pressure paid off because I got to see Emma Healey and M.O. Walsh in conversation. I have read and reviewed Elizabeth is Missing not so long ago but M.O. 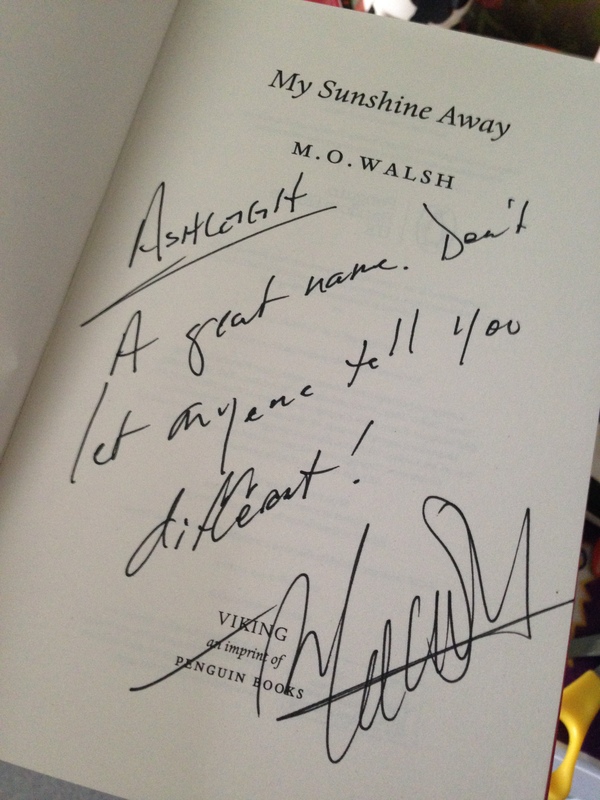 Walsh was a completely unknown author to me until the event. I completely forgot to blog about it so consider this the event overview. It was great. Emma had never ‘hosted’ before and she did a cracking job of it, it has to be said. We had a brief interlude of singing from Mr Walsh (who’s name I have forgotten, that is so awful!) I’m yet to read his novel but I’m very much looking forward to it. It seems quite interesting so we shall see. Anyway, it was a fantastic evening and I actually intend to start going to the book group because I met a couple of people there who inspired me! Also in the general, literary fiction category we have another recommendation from Ben at Waterstones in the shape of After Me Comes the Flood – again, this is one I know very little about but was inspired to pick up because I give in to peer pressure. On the top is a gift from my friend Sar – we met in London on the 20th and she finally gave me my Christmas gift. She knows my love for Ali Smith and gifted me with the gorgeous Penguin anniversary edition (I think it was for their 75th). Finally we have a bargain in Oranges Are Not The Only Fruit as I picked this up today for a whopping 50p. It’s pretty much brand new too! Result. The next pile is my classics. From the top we have two charity shop buys – Ted Hughes Crow and finally my own edition of The Prime of Miss Jean Brodie which I first read in a book group because of Cait a good number of years ago. The remainder of these were bought in London. Sar and I met at Platform 9 and 3/4, naturally. It was actually the first mutual station between our inbound trains so it was also a good plan. In Kings Cross there is Watermark Books, which is very sadly closing down soon. Anyway, in there I picked myself up The Persephone Book of Short Stories. It doesn’t have the bookmark but hey ho! After that we went to a few other bookshops, where I was restrained but I was saving myself for the Persephone store. It is truly beautiful, I did fall a little bit in love. In there I picked up their 3 for £30 deal – I picked up The Montana Stories by Katherine Mansfield, No Surrender by Constance Maud and finally Flush: A Biography by Virginia Woolf. The bottom book, another edition of Orlando, is a very beautiful hardback that Sar treated me to in Foyles. I should have hugged her longer for that! Some fantasy-ish stuff now! These are relatively self explanatory. 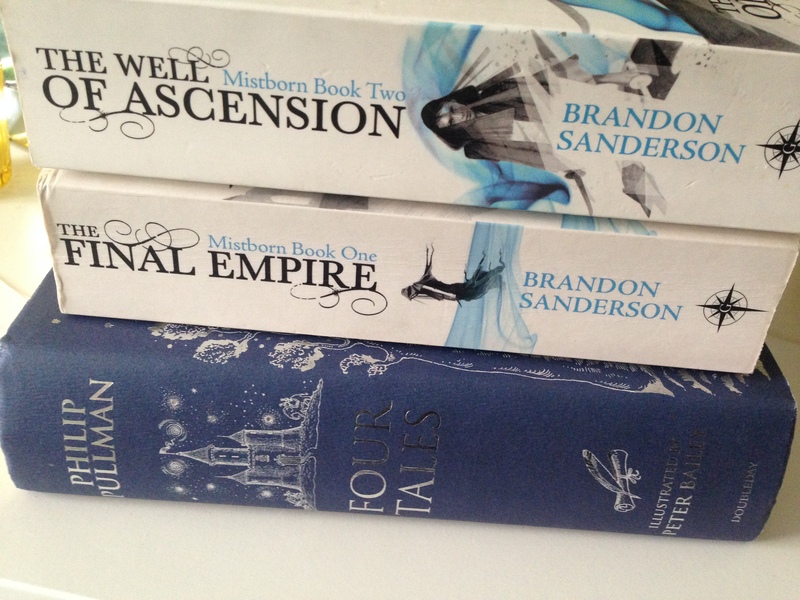 I want to get more in to fantasy as I think when I’m in it I will love it, so when I saw the first two books in the Mistborn trilogy by Brandon Sanderson in a charity shop for 50p each, I bought them. Simple. Don’t know what to expect but I think I may read these pretty soon. On the bottom is a beautiful, beautiful book that I have had my eye on for quite some time. I was out with a friend and we happened to dive in to a little antiquarian bookshop on Elm Hill in Norwich. Elm Hill has been used in a number of movies including Stardust and it is all medieval and beautiful. Anyway, I saw this Philip Pullman book and I fell in love – the fact it was only £7.50 made the deal a little sweeter! I shall definitely be heading back to The Dormouse Bookshop in the future as they have far too many pretty books! Finally we have the non fiction. 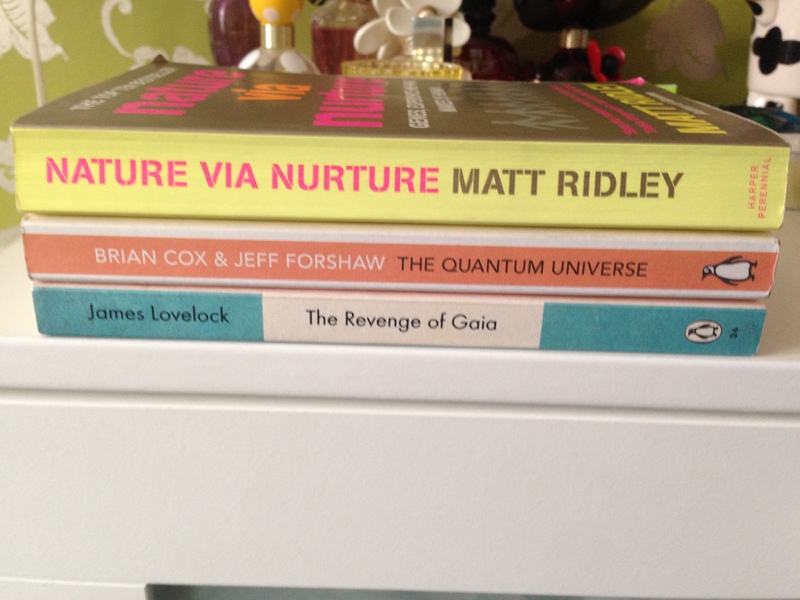 Two of these were bought in London also – on the top we have Nature via Nurture by Matt Ridley. I’ve read a book or two by him in the past and, I saw this in Daunts books but refused to pay £9.99 for it then walked 3 minutes down the street and found it in Oxfam for £2. Then we have two Penguin books; one in the orange spine-pretty cover editions by Brian Cox. I’m not a physics kind of girl – I hate anything maths and physics without context so I’m hoping Brian will sweeten the deal a bit. Then we have another of the Penguin Anniversary editions in the non-fiction blue. I’ve been wanting to read this book for some time even though I know little about it – it’s one that has always caught my eye in the non-fiction section of the bookshops! These were all bought in charity shops, which ones I can’t remember! Phew. That seems like a lot of books. That’s a lot of books? That’s not including the few eBooks I bought and the 3 audiobooks that I downloaded… Oops. I really need to curb my book buying. If there are any of these that you’ve read and recommend please share as I’d really like to know where to start! I really cannot wait for this crazy exam period to be over because I’ll no longer feel the compulsive need to buy books in order to relax. I don’t understand why I do it. Maybe it’s simply that books make me feel warm and fuzzy on the inside and that, in turn, releases endorphins. I don’t know. All I do know is I have bought too many books again this month. Though, they’re all books that I’ve been wanting to buy and, in fairness, a lot of them were bought with points/credit in various places so… not quite so much money spent! These books are pretty varied, from impulse buys to those that I bought after a lot of debate. Some I have already read in the past but didn’t own a copy of. I bought a number of classics as I really want to get a lot of them read over the Summer. Also, Penguin English Library editions are a great way to boost a buy up in price over the £10 limit that generally gets a stamp on a card in most bookshops! Then there’s also a bit of non-fiction there, I want to also read a fair bit of that over the Summer to keep my mind active! Anyway, on with the books themselves because that’s the important part. So I’ve sort of procrastinated doing this post because I have an embarrassingly large number of books to haul. So basically, I was really good from September, very few books were purchased however from January, I seem to have acquired a vast quantity of bookish goodness. So I don’t really know where to start, they’re all jumbled up, there’s no chronology to this whatsoever, I just made them look pretty in piles! This is going to be long so I apologise in advance! We’ll start with the general fiction I purchased the last few months. After reading Oryx and Crake I decided to buy the next book in the series from Atwood – I haven’t read this yet but I’m looking forward to it. Next up we have two books by Emma Donoghue – I previously owned The Sealed Letter in a large paperback which was too bulky so I bought the standard paperback when I saw it for about £1 in a charity shop and I picked up her newest book Frog Music in (quite shamefully) Tesco along with another book further along in this haul in their 2 for £7 offer. Finally we have my additions that I got in the buy one get one half price in Waterstones on campus; Elizabeth is Missing and Station Eleven. I’ve already read Station Eleven and my review can be found around here somewhere! 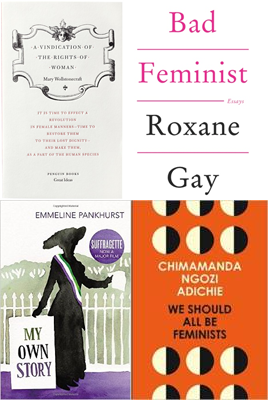 So I put these 4 books together as they have the theme of “not set in UK or America”. I’ve previously read Memoirs of a Geisha but I didn’t own a copy! So I remedied that as I would love to reread it. Sea of Poppies I admit was an impulse purchase because I just adored the cover. It is beautiful and I have no idea what it is about. The Kite Runner is a book I have long since wanted to add to my collection as I loved Hosseini’s other two novels so I found this for £1.99 in a bargain bookstore and I couldn’t resist! Finally, I’ve heard good things about Zafón so I decided to pick this up when I found it for 50p in a charity shop in good condition. Whoops. This is a little blurry! So The Secret History is a book I have heard nothing but good things about and, as I type this, I am 100 pages in to it and enjoying it so far. I picked this up as the other book in the 2-for-£7 in Tesco. Below that is Sister by Rosamund Lupton which is a book I’ve heard a lot about from a number of places. It’s not something I would ordinarily pick up so we shall see how I feel about it! IT was only 50p so if I don’t like it I don’t feel too guilty! Ali Smith time. So I’ve read a lot of these but the cost of them meant that I borrowed a lot of them from the library or owned the eBook. As I was going to the literary festival event I felt it was about time I invested in them. Over the course of February and March I managed to almost complete her bibliography, I don’t own the play she wrote and possibly one other thing but this is it and it looks beautiful together on the top of my bookshelf! Artful, There but for the, Free Love and Like I bought from various sellers on Amazon. Other Stories and The First Person I bought at the signing on the 17th! Yes. My classics this haul comprise of a running theme. Virginia Woolf. I love Mrs Dalloway and I had an Amazon voucher come my way so I snapped up a few of these Penguin Modern Classics. I love the modern classics. I love the uniformity on my shelf. They look beautiful. So I’m intending to lose myself in some of these soon! 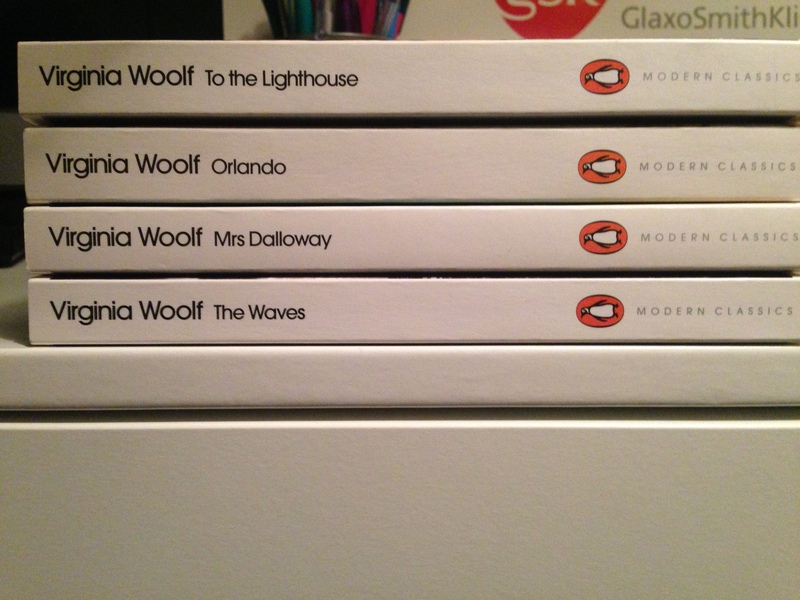 I bought To the Lighthouse, Orlando, Mrs Dalloway and The Waves. I already have a copy (or 3) of Mrs Dalloway but I wanted a uniform collection. Finally, we have the Little Black Classics that I bought. These are the 80p books that Penguin released for their 80th anniversary. Over the course of the few weeks they’ve been released I’ve managed to indulge myself in 23 of them and I don’t think I’ll be buying any more. I’m yet to read any of these but I’m really, really excited to get started on them. Okay. So that’s my winter book haul. I’m thinking I bought more books. I must have. Anyway. If anyone could suggest which books I should start with definitely point me in the right direction! I may have gone a little crazy this month. Between meeting Sar, going on holiday and discovering a couple of beautiful little bookshops, I may have bought too many books. 39 actually. Or 41 if I include the two textbooks I bought and nearly 50 if you include the few cook books I picked up. Oops? So this is a post in which I go through them quickly. I’m not going to include too many pictures as I think nearly 40 is a bit extreme. Six of these books were covered in a previous post at the start of the month (Book Haul II) – so I’ll not include them. Instead, I am going to start from my holiday – which began on the 5th of September. These were the books I bought on holiday. I’ve read What’s Left of Me and The Hours. But both I own as kindle editions and really wanted to own a physical copy as they’re books I loved. The others were all books that I’ve heard good things about or have wanted to read for a while. The Hours – Michael Cunningham The Moon and Sixpence – W. Somerset Maugham The Hive – Gill Hornby The Luminaries – Eleanor Catton Les Miserables – Victor Hugo Americanah – Chimamanda Ngozi Adichie What’s Left of Me – Kat Zhang Where’d You Go Bernadette – Maria Semple Moranthology – Caitlin Moran I’m really looking forward to eventually reading all of these books. The Luminaries and Les Mis are obviously going to be two that take a long, long while to get through! A few of these were recommended books from the reading challenge I take part in (previously have been book club books or the like, so are worth double points!) which is my reasoning for picking books like Where’d You Go Bernadette up. Also, I enjoyed How to Be a Woman and I’ve had a few people tell me that Moranthology is an absolute must to read so – Yay! Coming back, if you follow me on twitter or read this blog, you’ll know that I fell in love with a bookshop. Here I bought a new edition of Rebecca. But when my loan went in I returned to Wymondham to have a little explore of the shop and I picked up a few books. How to Be Both, Frankenstein and East of Eden – all three which are books that were on my ‘to buy’ list anyway. But being able to pick them up in this cute wee indi bookshop made me feel less guilty. I also signed up to be a friend of the bookshop, meaning I get 10% off all purchases there. My resolution is to buy all the new books that I want there, rather than somewhere like waterstones or the like. Their philosophy is that if we bought 1 in 4 of our books at an independent bookshop then everything is good! So I’m going to try that. Currently I’m reading How to Be Both, and Frankenstein is going on next months TBR. East of Eden is a book I’ve wanted to read for a while. To be honest, I’ve been feeling this urge to revisit Steinbeck as I enjoyed Of Mice and Men before I had to dissect it! So I’m really looking forward to all three of these! While I was in Wymondham, I went on a little walk to explore the surroundings and stumbled upon a little antiquarian/second hand bookshop. I hate the term ‘second hand’, I much prefer ‘preloved’. Anyway, I went in (as you do) and may have had a little accident? This preloved place was just amazing. It smelt so good. Finding all of these beautiful books in the back just made it so much better. I love places that sell second hand/preloved because they’re just magic – you never know what you’re going to find and I love that anticipation. I’ve been wanting to read some Hemingway for a long while; The Old Man and the Sea has been sat on my bookshelf for years and it’s about time I rectify that. So a nabbed a couple more because these editions are just so tiny and cute! Aldous Huxley’s A Brave New World was picked up after a friend actually recomended it to me the day before. Steinbeck and du Maurier are self explanatory (read: require no justification). Next up is Charity Shop Haulage post-holibobs. This was quite successful too. Having enjoyed Notes on a Scandal I picked up another Zoe Heller book. The top book there is Wild Sargasso Sea by Jean Rhys. Having seen them in YouTube videos, I decided to pick up the first 3 books in the Percy Jackson series when I spotted them! I was really surprised when I found Miss Peregrine’s Home For Peculiar Children in a charity shop though – and it’s in mint condition. Result. Then for Helen of Troy – I read Cleopatra by Margaret George and really enjoyed it, so I’m looking forward to maybe sinking my teeth in to this next summer! The Birds, The Bees and Other Secrets is an impulse buy that I bought along with it in a 2 books for £1 offer! I bought a few more Vintage classics besides Revolutionary Road. Throughout the month I’ve also picked up The Three Musketeers and Catch-22. Neither of these appear to be on my Goodreads list so that takes the fiction haul past 40 books this month! Also this month I attended a customer evening at Jarrolds department store – 10% off of everything. Result. Naturally my first stop was the basement where their book selection is. I had my eye on a couple of hardbacks, and knowing they had events with both David Mitchell (the author, not Mr Victoria Coren) and Clare Balding while I was on holiday, I was hoping that they may have some signed editions in stock. And they did. So I nabbed myself a signed edition of The Bone Clocks and a signed edition of Walking Home. I mentioned Clare in a tweet, saying I had a lovely evening and I received a lovely tweet in reply which resulted in possibly the highlight of my Summer. I can’t wait to get in to it! My last 2 books I have to justify. So I bought 2 textbooks in waterstones, now they do 10 points per £1 for students, my points balance is soaring quickly upon the purchase of textbooks at £55-£70 each. Not only that but you get a stamp for every £10 you spend so… I sort of filled a card up when I bought 2 textbooks and I ended up with about £10 on my card so I decided to indulge myself and buy two more of the Virago Modern Classic hardback du Mauriers. Aren’t they pretty? Especially with Rebecca pride of place on top of them. So yes. I think I’m going on a self imposed Book Buying Ban of sorts after this month… I really have no restraint. The last 3 days have been amazing. For those who don’t know, one of my dearest friends and I finally met after 10 years. It was the loveliest 3 days and it was just sad that it had to end so early. I cannot put in to words how amazing it was to finally give the girl who has stood by me for half of my life, through everything, a hug! But alas, it had to end sometime and it was just amazing that it was 3 days filled with awesome. Sadly, I only got one (very dishevelled) photo of the two of us at the bus station before she got on a bus home – but at least it is a photo! 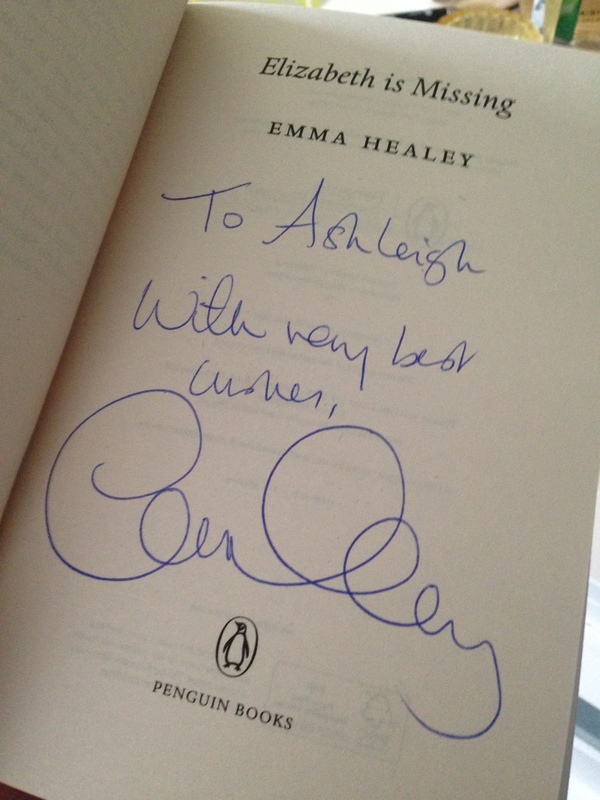 While she was in Norwich, we trawled around every bookshop in the city. Plus most charity shops. As such, I managed to find myself a few bargains and Sar managed to grab herself some nice books too (though quite a few less than me!) In the space of 3 days – across a number of shops – I’ve picked up a handful of books! You know when you just can’t stop stumbling upon good books? Then you can’t stop buying them? Yes, that has happened to me lately and – to make myself feel guilty and just STOP I’m going to do a post of most of them. So, essentially this is my Book Haul post. And trust me, in the last month there has been a momentous number of books come in to my possession. None of these are particularly works of great literature, but they’re all books I’m quite interested in reading or have just wanted to read for a long while. A full list will be at the bottom but I’m going to do a relatively concise overview of just a few that I’ve bought!